Android Oreo Has No Built In Settings That Hide This Annoying Notification, Many Of Us Don’t Want To See In Notification Panel, But You Can Hide This Annoying Notification Using A Third Party Android App. Just Install The App And Then Open It, Grant Permission To Notification Access Because This Permission Is Needed Otherwise You Can’t Hide Running In Background Notification. Once You Grant Notification Access Permission, You’ll See “Apps Running In Background” Notification Disappear, This Probably The Fastest Way To Get Rid Of Annoying Notification, If You Face Problem i.e. Notification Still Appear Then Simply Reboot Your Android Device, That’s It. But There Is One Problem You Might Be Face Is That If Your Android System Language Set To Other Than English Then This App Will Not Work Because Suitable Language Is Only English. So, You Need To Change Your Android Default Language In Order To Keep Notification Hide. 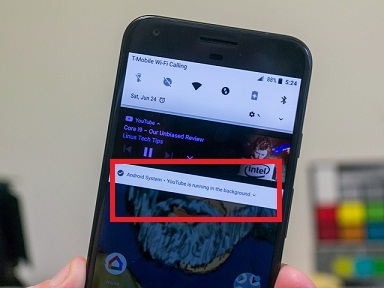 However Android Oreo’s Persistent Notification About Apps Running In Background Helps You To Check Out Which Apps Running In Background, Along With You May Not Want Unwanted Clutter In Notification Panel Like This, You Should Use This App Because There Is No More Ways To Hide This Clutter Notification.